One way to charge up a once-vital city. 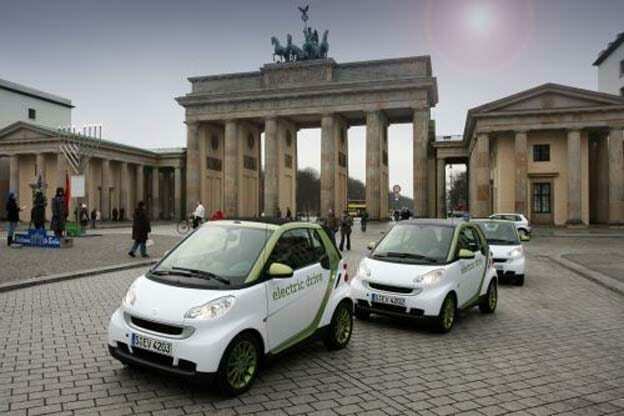 Smart electric cars by Berlin's Brandenburg Gate. The city wants to be the globe's battery car capital. For years German carmakers were deeply skeptical of electric cars – and basically they still are — but the German government, backed by the European Union, has announced plans to put one million EV’s on the road in Germany by 2020, which, in terms of vehicle development, isn’t very far away. Daimler AG chief executive officer Dieter Zetsche recently told the company’s shareholder, he doubts the goal can be met without government subsidies. BMW CEO Norbert Reithofer sounded a more optimistic note, declaring BMW would do what it could to help the government reach the ambitious goal. Meanwhile, the European Union is steadily increasing the regulatory burden on vehicles that rely on petroleum over the next several years as part of the effort to reduce emissions of greenhouse cases. Consequently, the city of Berlin is now looking for ways to become the principle EV center of not only Germany but all of Europe. Other cities around the world, notably Shanghai, also are interested in becoming centers for EV experimentation. Last November, the Berlin Senate, the equivalent of a city council, set up the Berlin Agency for Electromobility to help figure out how to help the city prepare for the coming wave of electric vehicles. Gernot Lobenberg, the head of the fledgling agency, said in a recent interview, the goal of the e-Mo agency is to concentrate on details such as making sure the charging infrastructure is in place for the wave of new EVs and insuring Berlin has an adequate supply of electricity to handle EVs. At the same time, the agency wants to make Berlin a platform for the kind of development that will follow the maturation of the EV industry, which will require support from sophisticated software, charging stations and new business models as well as batteries and other kinds of equipment, Lobenberg said. Education is another part of eMo’s vision for the future, Lobenberg said, adding that people will have to be trained to deal with both EV’s and the supporting infrastructure. Berlin also has a population already oriented toward supporting “environmental sustainability,” as well as a high proportion of early adapters with an interest in innovations such as early adapters. One fledgling company, which is preparing to do business in Berlin, is Yoove, which plans to create a Zipcar-like fleet of electric vehicles for short-term use. Lobenberg noted that as eMo began working in electric vehicle other issues also came into focus such as the need for expand use of devices for storing electricity not only in car batteries but across the electric grid. Vattenfall, the major electric utility serving Berlin and the areas around the city, has become a supporter of eMo’s mission. Like other utility companies in Germany and across the European Union, Vattenfall, will be required to produce 20% of its electricity from “green” alternative power by 2020, which means installing more wind and solar power now that the German government has begun vetoing expanded use of nuclear power in the wake of the devastating earthquake and tsunami that struck Japan in March. Harnessing wind and solar power requires more and better static storage capacity and eMo is pushing to make Berlin a center for the development of new storage devices, Lobenberg noted. Berlin also is uniquely adapted to the introduction of EVs. The streets are flat, the typical commute of Berliners who do get to work by are car is relatively short and usually well within the range of around 80 miles for the current generation of EVs — such as the electric Smart car or the Chevrolet Volt, eMo officials said. In addition, the traffic density in Berlin is relatively light compared to other German or European cities, making it less likely an EV driver will get in a traffic jam of any kind. Most of Germany’s automobile industry is west and south of Berlin in places such as Stuttgart, Munich, Frankfurt and Volkswagen’s headquarter in Wolfsburg, though VW, Porsche and BMW have all built new plants south of Berlin in cities such as Dresden and Leipzig. By making Berlin a center of the EV industry, eMo hopes to restore revive a city that was, up until the start of World War II, the very epicenter of German industry and the science and innovation that supported it. But Allied Bombers and Soviet artillery left the city in ruins. The Cold War that followed made the restoration of Berlin’s industrial base very, very difficult. Berlin’s economy now rests on tourism and the German federal government ministries, which began moving back to the city in 1999. Lobenberg, however, is optimistic the coming shift in automotive technology can give Berlin an opportunity to capture a piece of a vibrant new industry and bring talent from all over the world back to the German capitol.